Defunct Audio Manufacturers - Ap to At - audiotools.com. USA based company, originally founded in 1981 and commenced the manufacture of full range ribbon speakers in 1982 with a model known simply as "The Apogee". Initially very successful in the North American high end market with a number of audio magazines proclaiming it as their reference loudspeakers. Ran into some problems in 1988 when the company was forced to compensate Magnepan for the unauthorised use of patented Magnepan technology in their speakers. Apogee went out of business in 1998, but there is a webpage dedicated to the company and its products called Apogee speaker user website that has some support information. Not to be cofused with Apogee Electronics. Small USA based company founded in 1979 by Tom Holman, an ex-Advent engineer. Apt manufactured a mid-high end pre-power amplifier combination but those did not sell in any great quantities and in 1980 Mr. Holman closed up shop and went to work with Lucasfilm. AR See --> Acoustic Research (AR) (1954 to 1967), Acoustic Research (Teledyne) (1967 to ca 1985), International Jensen (ca 1985 to 1996) & Recoton (1996 to 2003). Aronov (Valve amplifiers) See --> Yakov Aronov Audio Lab Inc. Founded in 1959 by A. Steidinger the son of DUAL and Perpetuum-Ebner founder Joseph Steidinger, operated primarily as a plastics moulding factory and indeed worked as such for several well known German hi-fi manufacturers, the company nevertheless put out some audio products on it's own such as portable record players and cabinets, the company ceased trading in 1976. More information on this company can be found on this page (in German). Small company based in Suffolk, New York, USA that distributed record related products in the USA in the late 70’s and early 80’s. Originally founded in 1977 and was primarily a distributor of cutout records but did also distribute record cleaning products such as the Groove Tube cleaning brushes and chemicals, these were actually made by an unknown NY based gentleman that traded under a variety of fake company names all beginning with the word “Win”, including “Win Products”, “Win Industries” and “Win Cosmetics”. The Groove Tube brushes main claim to fame was that it only retailed for about a third of what the competition was charging and it featured a rather clever combination brush and liquid bottle. The company was run by Mr. Lewis and vice president Jim Goldstein (ex-Apex Records) until the early/mid 80’s where it disappeared from view although the company was not dissolved technically until 1991. Italian manufacturer of high end loudspeakers, founded in the late 1990s by Claudio Popovich but timeline is not clear and in fact the company may still be going but we havew not been able to contact them for a year or two. Mr Popovich started out as an amateur speaker builder in the 80s but in 1991 won a loudspeaker design competition called "a sound for Europe" (Un Suono Per J'Europa) run by Italian audio importer Entel and International Jensen, but in that competition amateur loudspeaker builders in Italy were invited to come up with speaker designs that suited Italian tastes better than the products that IJ was selling at the time. Jensen was so impressed with Mr. Popovich's design that actually started manufacturing them as the AR Contest Series, initially with a 2 way bookshelf model called Contest 9 but later a 3 way and a floorstanding model were added. IJ folded in the mid 90's and soon thereafter Mr. Popovich started Artis Sonus that manufactured refined versions of the Contest series. Actually a group of Asian based companies with headquarters in Japan, used to manufacture audio products, mostly budget and portable audio sold under the Asahi brand but also made some low end separates in their Singaporean Asahi Electronics subsidiary (est. 1972) under the Fair Mate trademark in the 70's and possibly the early 80's, the use of that trademark has been discontinued in the west but it is still used for some brown goods and communications equipment in the far east, I have been unable to establish if that trademark is still under the control of Asahi Corp. The later established subsidiaries of Asahi Electronics in Thailand and Asahi Industries in Malaysia have also produced some audio products but it is unclear under what brands they were sold. The group was best known for producing toys and "gadgets", it was bought out by Casio and the main Japanese company is now known as CASIO Creative Products Corp., the Ashai Electronics divisions in Thailand, Singapore and Malaysia however are still running under that name as independent subsidiaries of Casio. Please note that there are quite a few Japanese companies that bear the same or similar names that are not related to Asahi Corp. and in fact there are another Asahi group of companies or 2. Company based in Denver, Colorado, USA that sold loudspeaker parts and similar equipment but later added a line of kits and possibly some fully built units as well, some of them being of excellent quality including the Signature 717 model that was designed for A&S by Joseph D'Appolito. The company is perhaps best known for their promotional events and literature, but A & S Speakers hosted DIY loudspeaker design contests and spew out literature with sundry information related to speaker building with an almost alarming frequency. Timeline is unknown. Incorperated in 1933 by Creed McKinley Chorpening, F. H. Woodworth and Charles E. Semple in Youngstown, Ohio, USA and started to sell microphones under this name a year later but actually had sold mics under another name at the least a couple of years prior to its incorporation. Started manufacturing phonographic pickups in 1938 and other audio related transducers a little later. Moved from Youngstown into a purpose built factory in Conneaut in Ohio in 1944. Appears to have gone out of business in early 1987. Note that the current trademark owners have no relation to the original company and appear to have simply appropriated the trademarks. 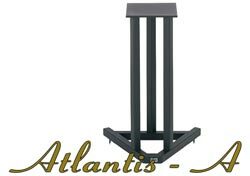 We have actually not been able to establish what company or people were behind the Atlantis branded line of loudspeaker stands and AV furniture, all that we have managed to nail down is that the brand was Canadian and appears to have started out in the 1990’s although it is possible that it is older. The company had one of the bestselling hi-fi racks of the 90’s in the “Harmony”, a fairly inexpensive but quite good looking angled rack that featured 4 MDF shelves in addition to a small metal top shelf intended for accessories or CD’s, it should be noted though that during the last couple of years before it was discontinued in around 2001 there were complaints about construction quality. By 2004 their range included 2 series of AV and hi-fi racks in addition to a large range of steel frame loudspeaker stands available in most price ranges except the “exotic”. Their most popular loudspeaker stand was a mid-priced model called the “Reference” that is actually somewhat sought after on the second hand market today even though the company had more upmarket models available. In 2005 the Atlantis announced that they had stopped selling everything apart from the Reference line of loudspeaker stands and by 2008 the company had had disappeared altogether. If anyone out there has any further info it would be welcome to hear from them. Below we have a list of most models the company was making from ca. 2001 to 2005, note that a couple of models were newer in any catalogues from Atlantis so the info on them is a bit skimpy. Also take note of the fact that unlike most other technical info on the site the weights and measurements are given in imperial measures rather than ISO, but these stands were only sold in the Northern American market and I gather people living there know how to make use of archaic measurement units. All RRP values are ca. 2005 and in USA dollars rather than Canadian simply because we have not been able to find original Canadian RRP for any of them, all prices are for pairs in the case of loudspeaker stands, there was also a kit sold that gave you an additional shelf for the Reference series of racks that retailed for USD 70. A 12 - 16 - 20 - 24 7 x 7 - Bent Metal 4 - 5 Yes No ? Allegro 20-24-30 7x7 9.5 x 11.5 Tube 7.5 - 9 No Yes ? AS1 40 5 1/2 x 7 1/4 - Tube 8 No No ? AS2 40 - - Tube 19 No No ? Match 21-24-28 6 1/2 x 7 1/2 10x12 2x2 9 1/2 x 11 1/2 No Yes ? PRO 20-24-28 6 1/2 x 7 1/2 10x12 Tube 17-22 No Yes ? Reference XL 21-24 8x9 10x12 3x3 50-55 Yes Yes ? SBF 28 6x6 10x12 1 1/2 x 3 13 Yes Yes ? Signature 20-24-28 6 1/2 x 7 1/2 - Tube 9-11 No Yes ? WB1 - 6 x 7 1/4 - - 2 No No ? Very little is known about this brand, except that it is Japanese and other Asian electronics of at the least reasonable quality that were distributed by some of the same companies that were distributing NAD products in the early to mid 70's but at a slightly lower price-point, leading us to believe that this may have been an early branding exercise by the same people.